We woke up at 11pm, mist overhead obscuring the sky, but the temperature wasn’t bad at all as we put on our many layers. 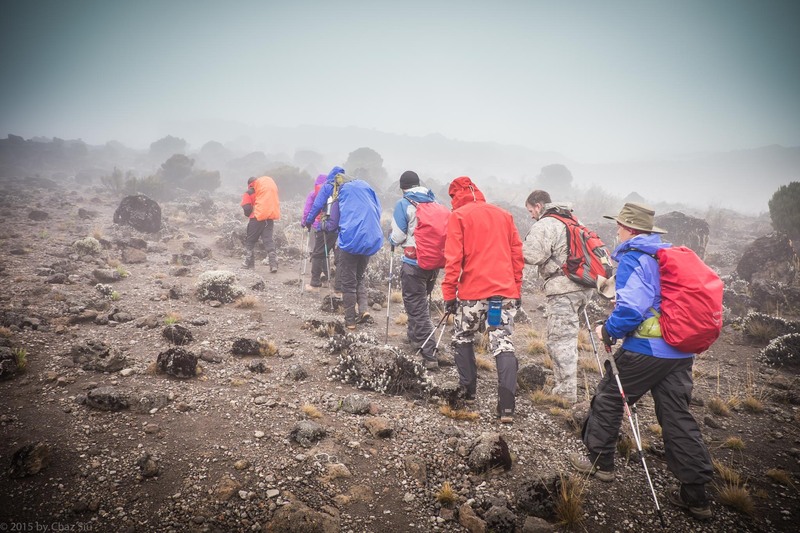 I actually opted out of a rain jacket layer, as I knew fleece would have me sweating hard with a big down jacket on the outside, particularly as we were about to make a 3000 foot vertical ascent straight up to the crater rim. We got our water filled, filled warm water bottles in case our Camelbak hoses froze (they did), grabbed snacks of chocolate bars and ginger cookies, and said relatively little as we sat in the mess tent, eating our oatmeal porridge and drinking black tea and coffee. I was lucky, as I’d managed to get a solid 4 hrs of uninterrupted sleep since dinner, and I felt pretty good. 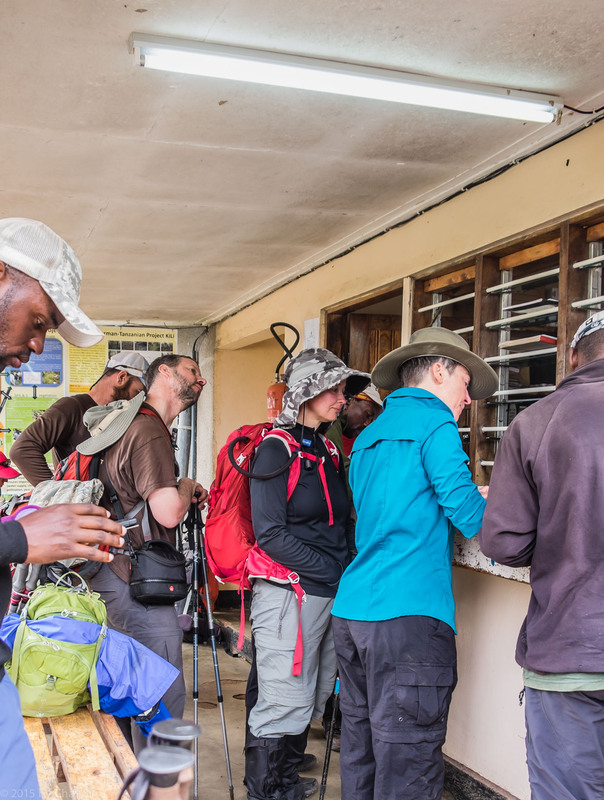 At last, JT lined up the guides in front of and behind us, with instructions for us not to work too hard – just pole pole up the mountain. 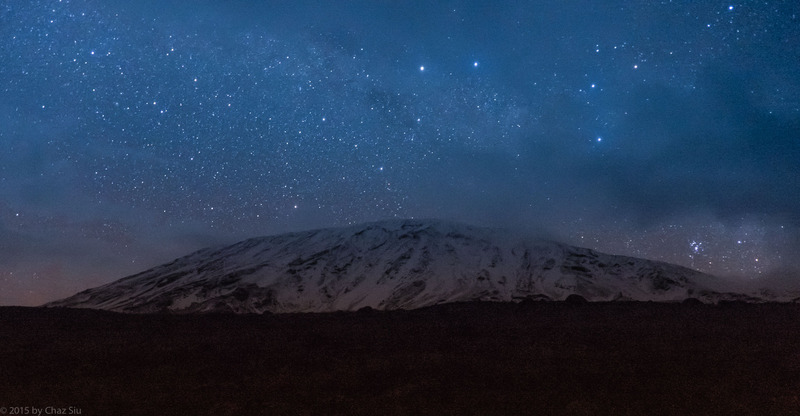 We flipped on oiur headlamps and started up through the boulders slowly trudging along in the loose scree…so it began. There were waypoints here and there, and the crowd headed for the summit was a zigzag twinkly of fireflies as high as we could see. 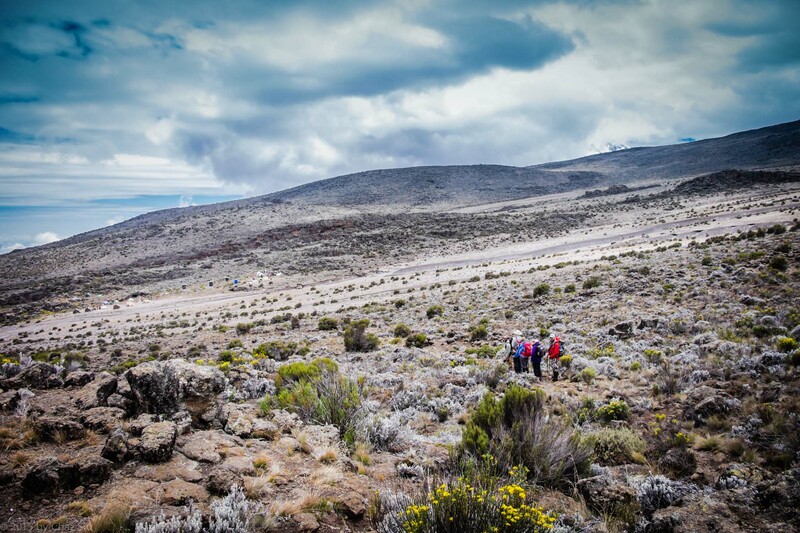 We mainly listened to the sounds of the guides as they sang and called to each other in Swahili – figuring out if one team should pass another — this was, after all, more or less a single track path upwards. 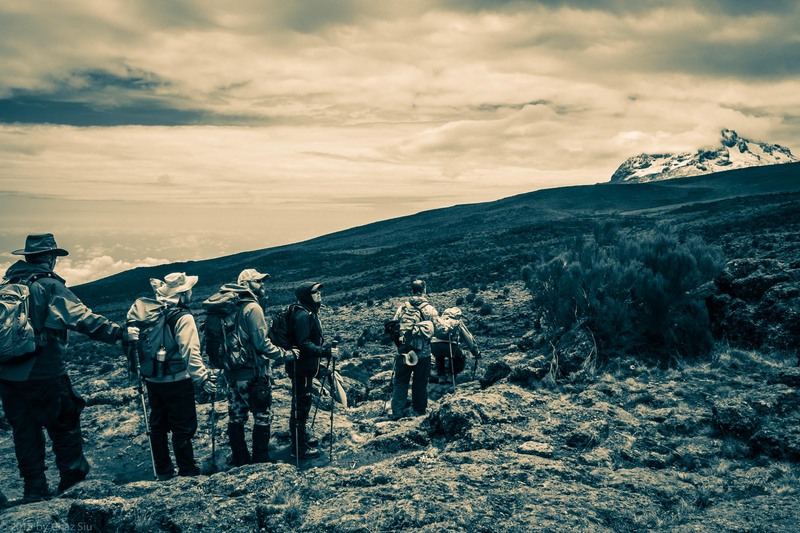 When we stopped for rest, Said, Viviano, Halid or JT, would open our packs for us and pull out snacks…allowing us to expend as little effort as possible as the air grew thinner. At length the group split up, with Rhys, Kitt, and Cort going ahead with Said, while the remainder of us moved a little slower. 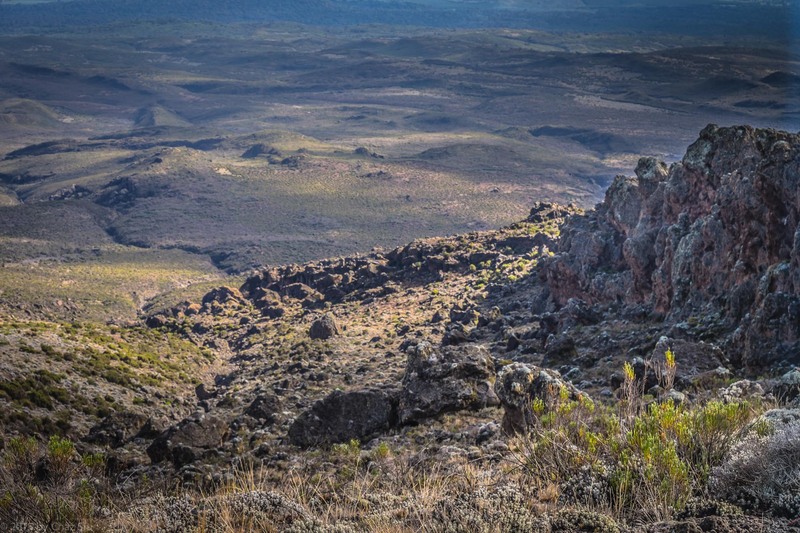 The final 200 yards was a vertical boulder scramble that seemed like it took forever, with the crater rim in sight, the sounds of excited voices above. 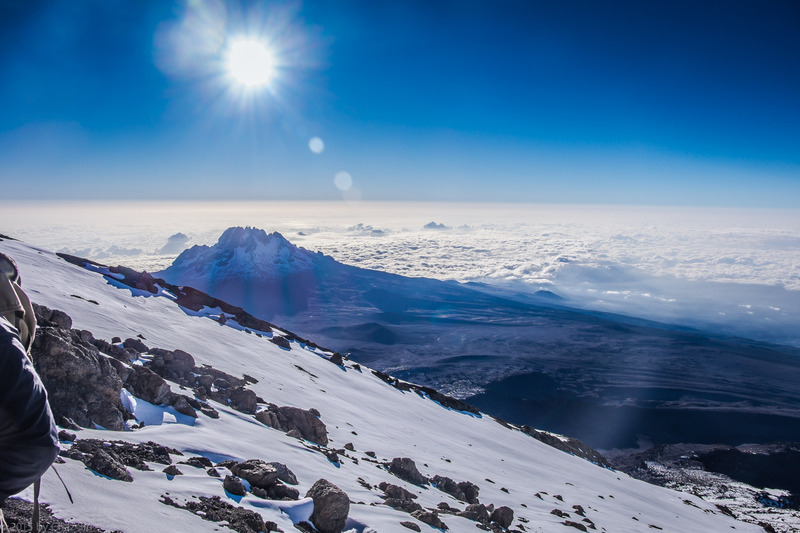 Since it was a slog with a train of people, we finally turned and saw the great orangle globe emerging from the clouds, Mawenzi far below us — looking almost small, and the horizon with a slight curve to it..the earth really is round! CRATER RIM REACHED! We crawled out of the rocks into the middle of a crowd of jubilant summiteers, all gathered round at Gilman’s Point. 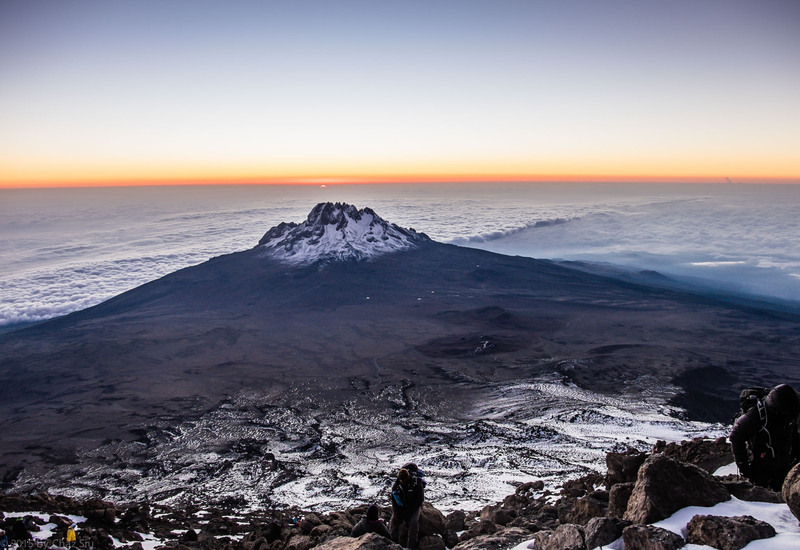 My body was exhausted, but had no altitude issues at all – it felt like i was breathing normal. Alex, Caryl, and Paul were in great shape, while Irina was having a tough time getting air. 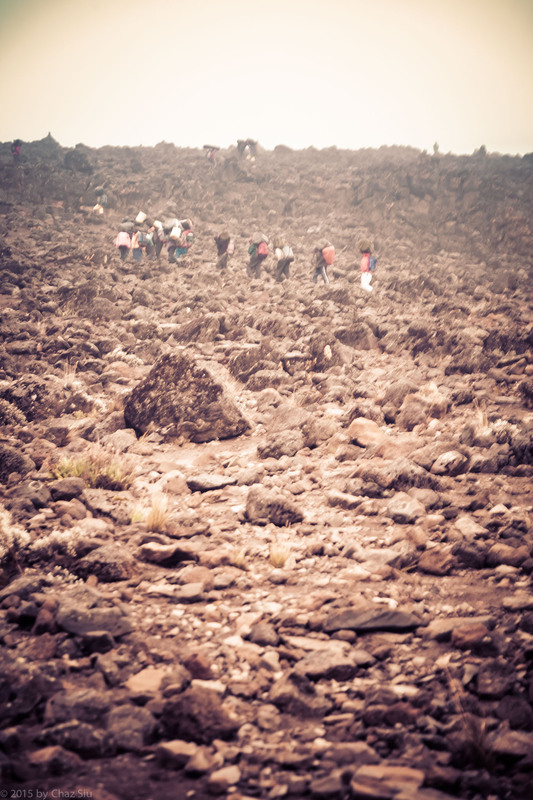 We snapped pictures quickly and then started around the crater rim towards Stella’s Point. Team At Stella Point, Elevation 18, 800 feet. We got To Stella’s Point and Irina descended with Viviano to get her oxygen back. 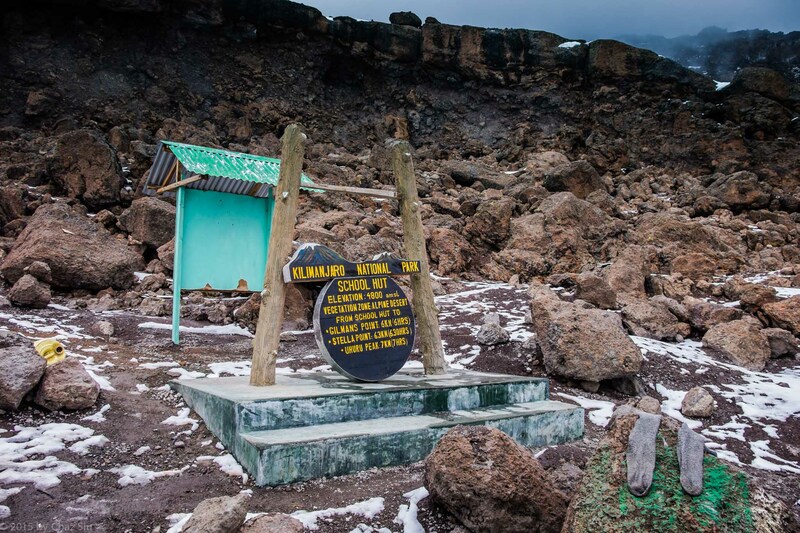 She’d made it to the crater rim – no mean feat. 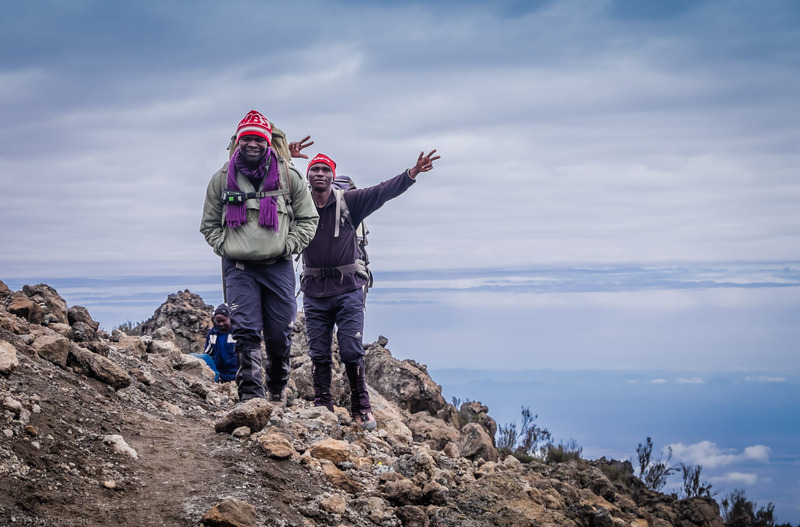 I was exhausted, but after talking to JT, he said if all I felt was tired, then we’d go Pole Pole to the summit (Uhuru Peak)…which we did. 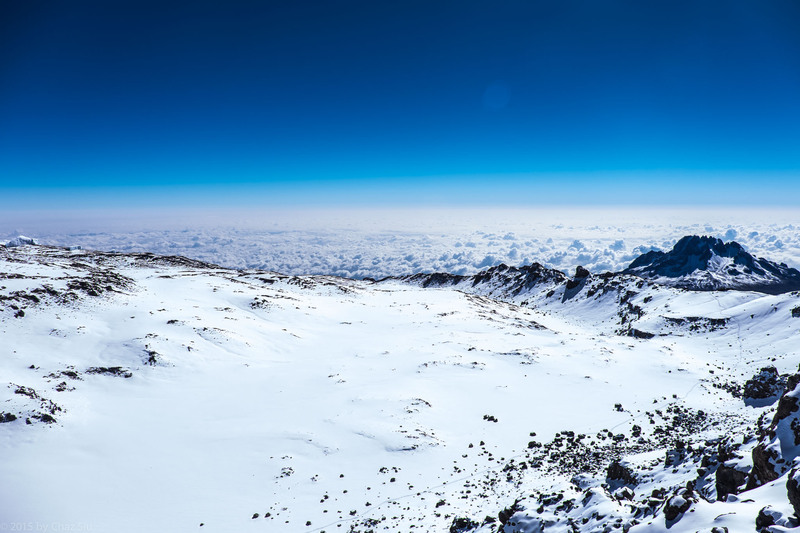 The crater rim was simply stunning, with cubic glaciers on the outside above the infinite clouds, and the giant bowl on the inside. 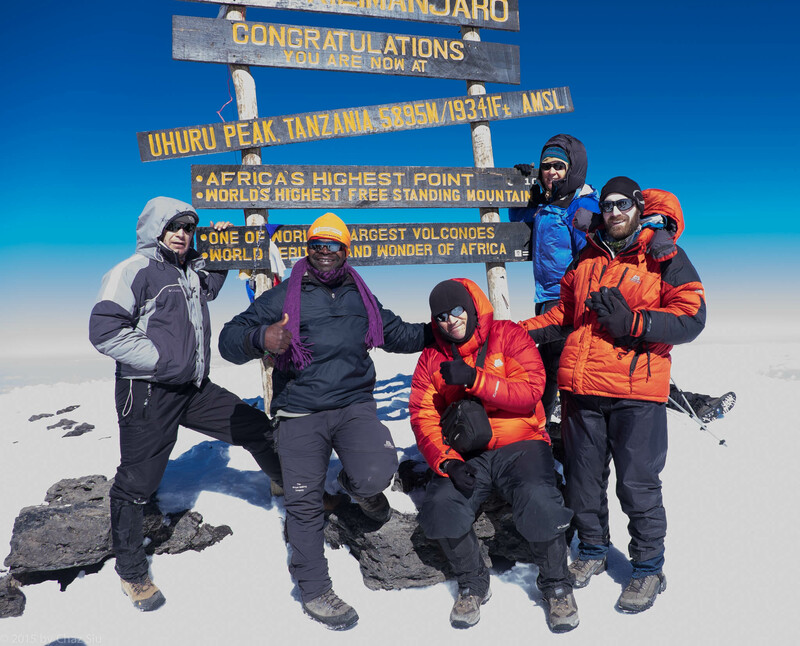 Uhuru Peak Summit – The Roof Of Africa. L to R, Alex, JT, me, Caryl, Paul. Rhys, Cort, and Kitt had summited an hour a head of us. 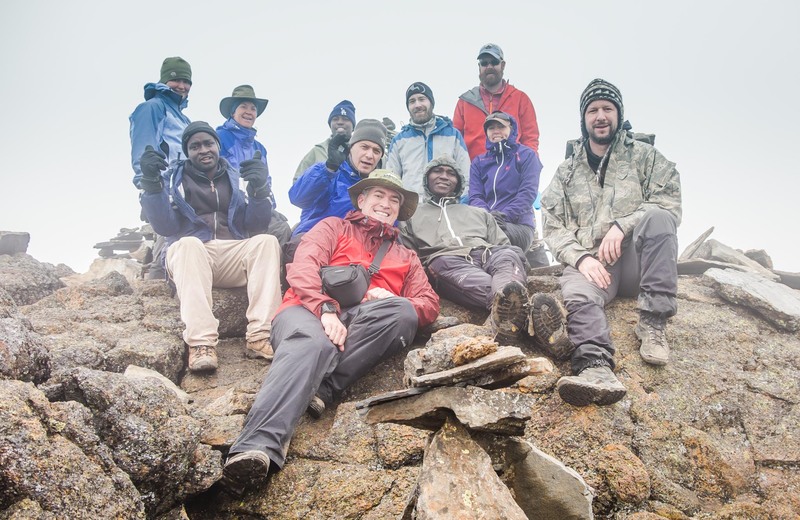 Once we got to the Uhuru Peak summit (19,341 ft) and grasped what we’d done, I muttered a quick refrain from Toto’s “Africa”, we took our pictures, then I busted it down with Said, so tired I was stumbling, and they watched me closely. We got back to Stella’s point in record time and immediately started down, with Alex, Caryl, Paul not far behind with JT. 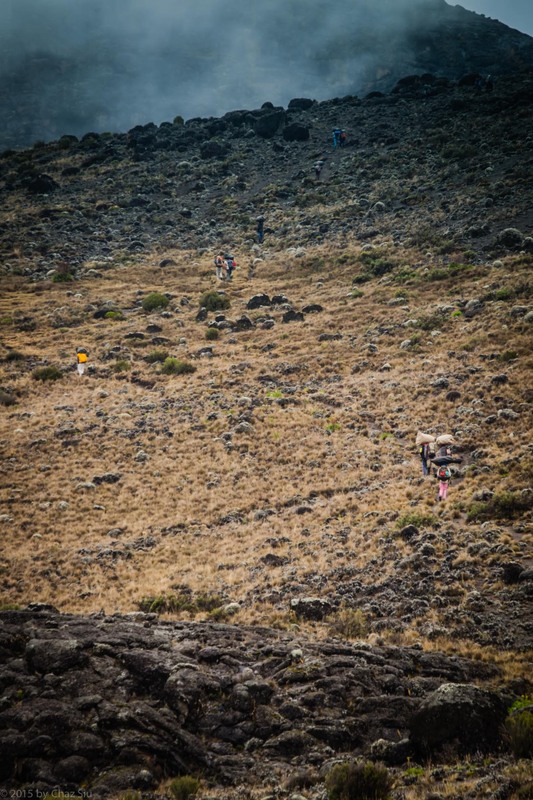 The descent to Barafu was kind of a blur, as I was pretty out of it, but I managed to make it unscathed, had lunch, then we descended further all the way down to Millenium Camp at 12,500. 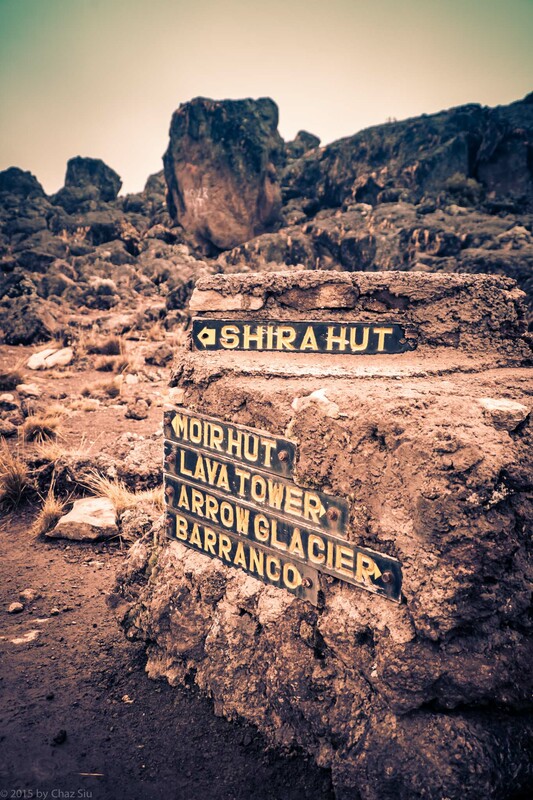 The 5 hr descent after 8 hr of altitude hiking wasn’t welcome, but not as if we had a choice. Alex and I both jammed our toes, and even as of this writing, my right toenail is black and probably leaving this mortal coil. Fortunately, Millenium Camp was gorgeous. I crawled into my tent and crashed hard after 12 hours of hiking. At dinner later, Rhys, Cort, and Kitt indicated they’d only gotten into camp a half hour ahead of us. 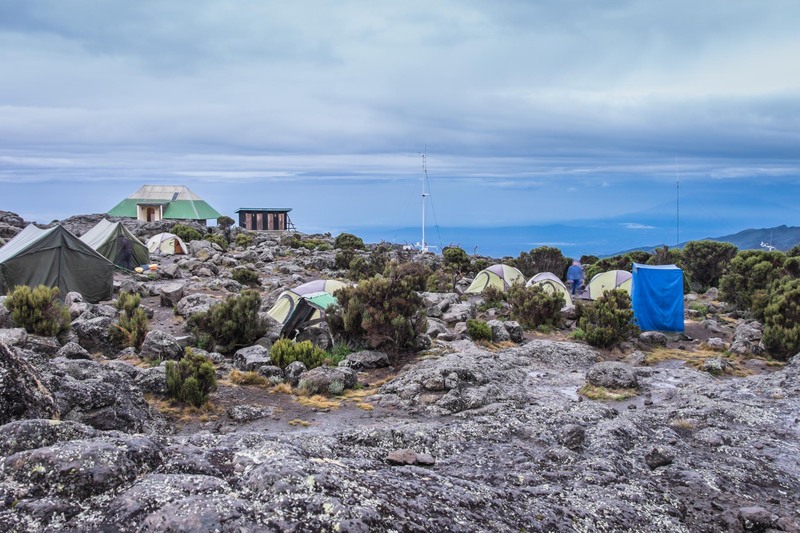 We overnighted at Millenium; the next morning was tipping ceremony with our whole summit team, where they sang and danced a Swahili celebration dance for our Kili summit. 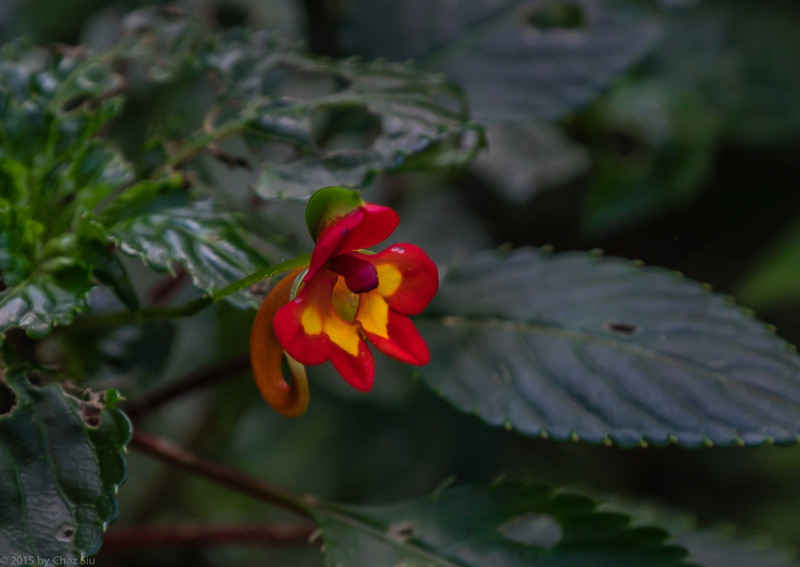 Afterwards, we headed down through the moorlands and back into the rainforest, where we saw Mt Meru in the distance, Kili framed above us, and more beautiful flowers. 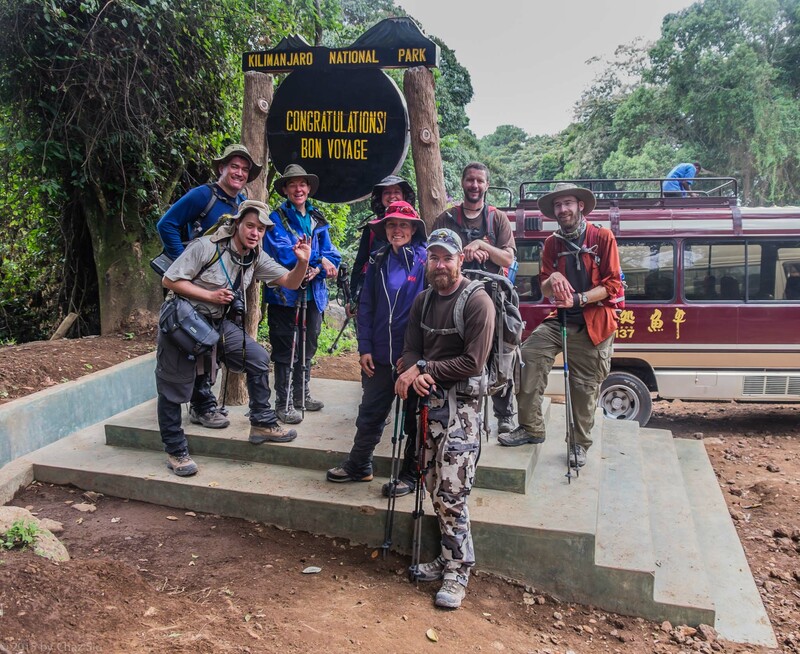 At long last, we reached the final gate…did our last team picture together, signed out to get our certificate for climbing the mountain, ate lunch, and sat quietly in the bus on our way back to Arusha. 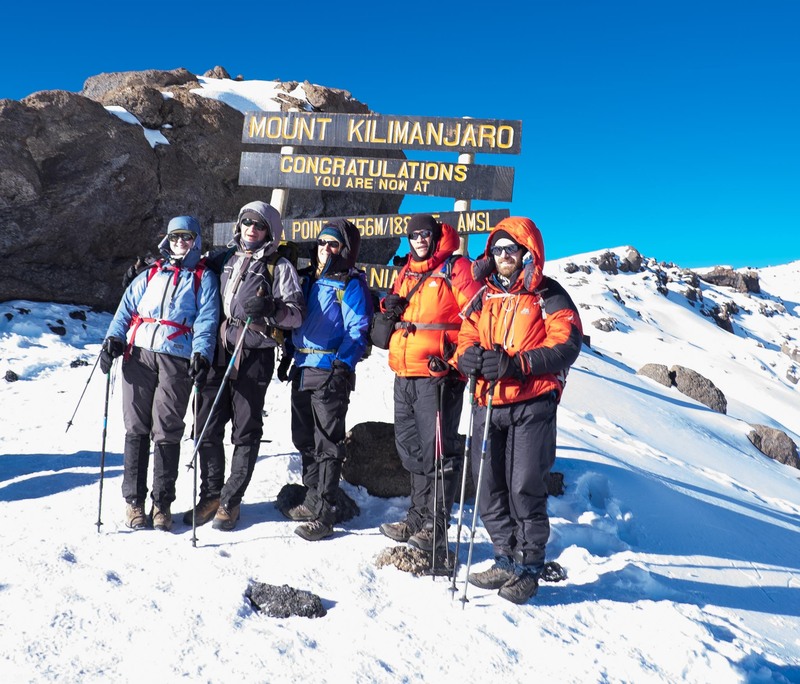 What a grand adventure – a sense of accomplishment that’s hard to describe and relishing our fortune in having an excellent guiding company and a team where we all got along in our many days on the mountain. I felt truly blessed and exhilarated. Through Peak Planet, the best reviewed agency we found. 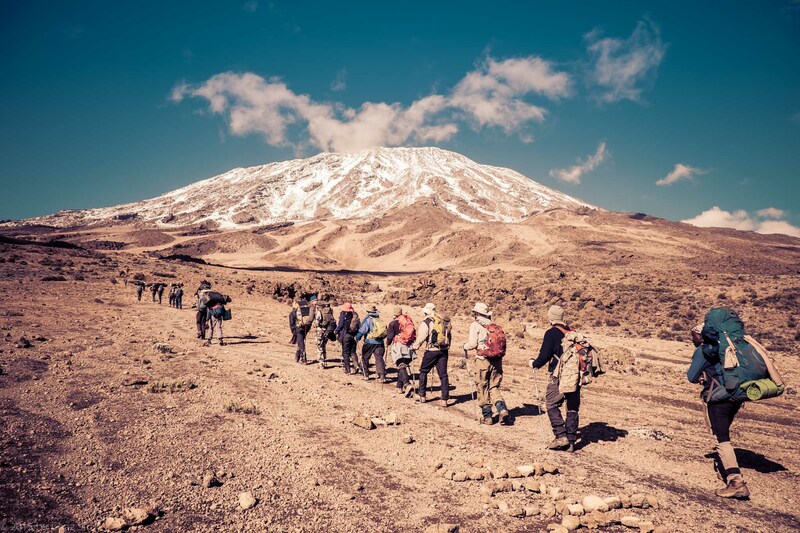 Researching the Kili guiding is an exercise is due diligence – but something to consider is the treatment of porters and guides helping you up the mountain. The cheaper operators have a reputation for porters and guides with tattered clothing, substandard shoes, and not getting paid for the many days away from their families. 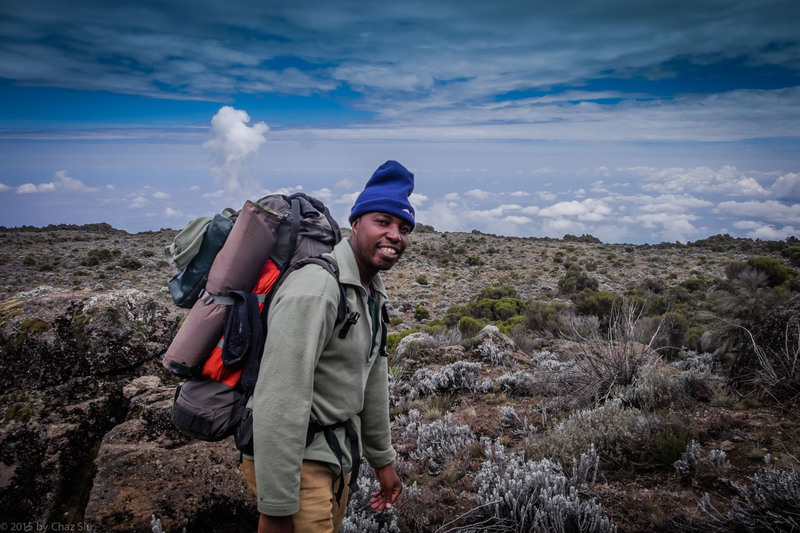 From all testimonials and references, Peak Planet is the opposite of that, working with the African Walking Company to ensure good treatment while keeping the prices reasonable. I have zero stake in Peak Planet, but the blog should speak for itself – the guides and porters were excellent, friendly, helpful, courteous, etc. all you could ask for on such a comprehensive undertaking.What camera did you use? Our night at Third Cave Camp was pristine, with nary a patter of precipitation or wind. 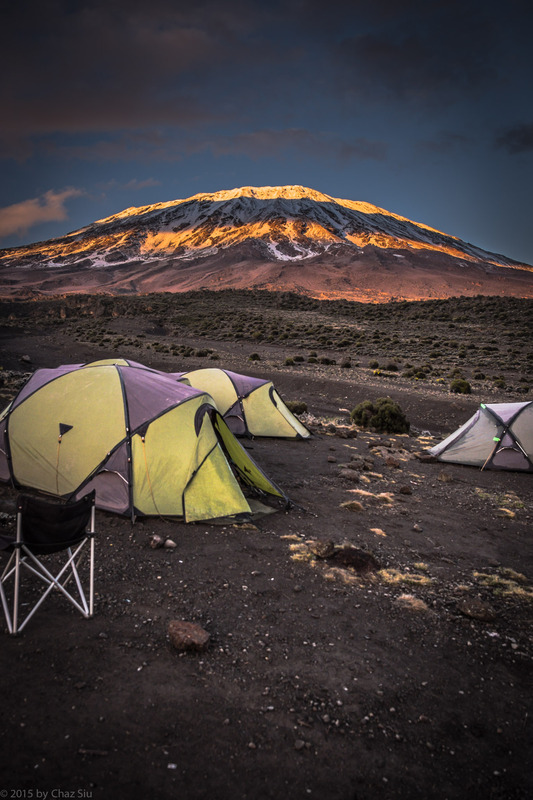 There were rock strata about a 50 yards from the camp, and I popped out of the tent at 5ish, switched on my headlamp and meandered through the shrub to climb the formations, tripod and camera in hand, then snapped away as the sun rose over our near perfect view of the Southeastern side of Kilimanjaro, as the camp slowly woke up over the next couple hours. Cooking And Mess Tents At Sunrise – Third Cave. 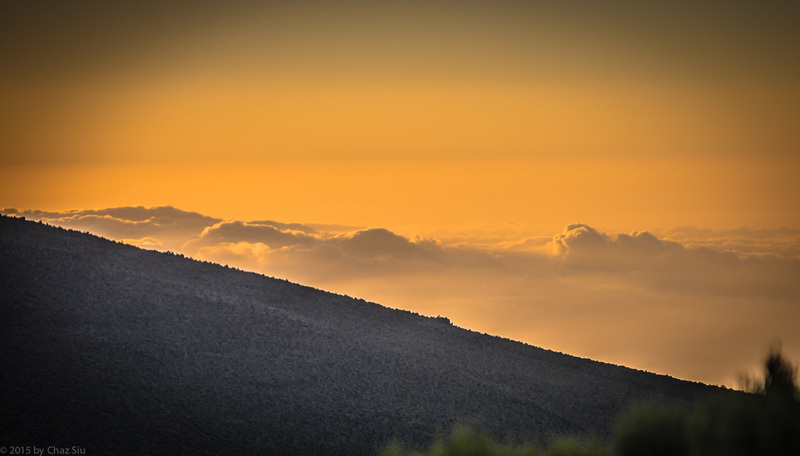 You can see the rock formations I climbed for the early AM photos of Kili. 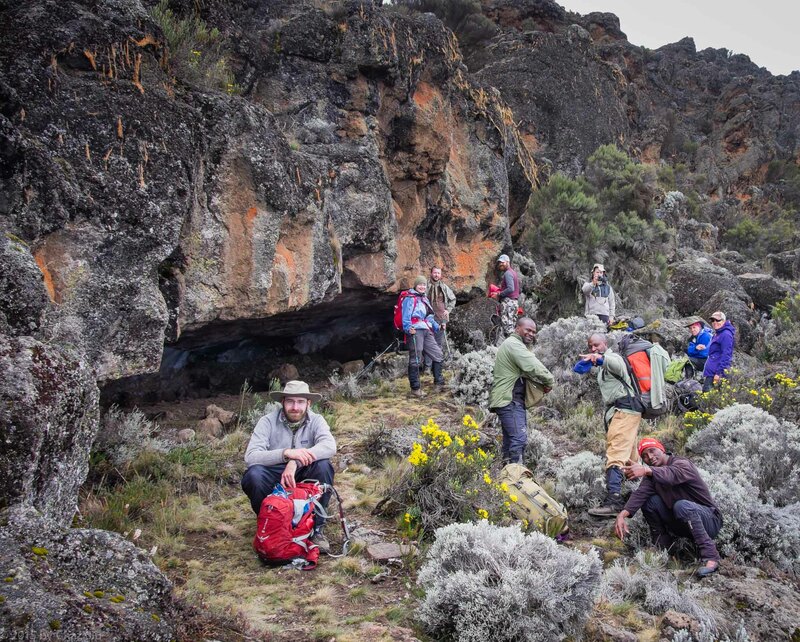 Third Cave amounted to base camp – our last full night of sleep before we summited the mountain, and the beginning of a LONG period of hiking. 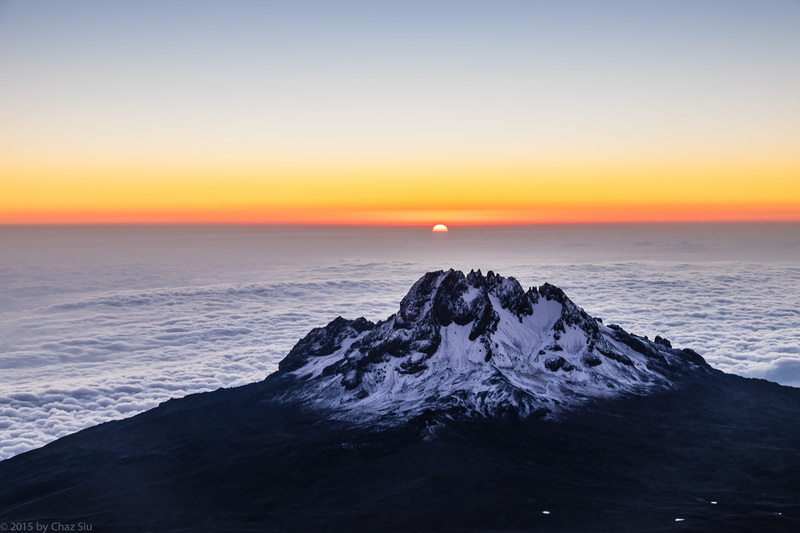 In the morning after breakfast, we would ascend from 13,000 feet to Outward Bound School Hut 15,500 feet, have lunch, nap, have dinner, then at 11pm, make the summit attempt. 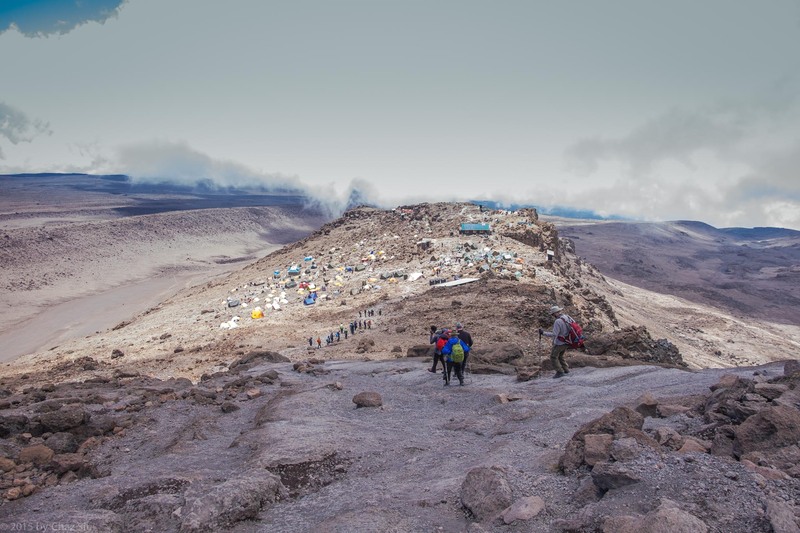 We marched out of camp at 8:27am and into the Kibo saddle that separated multipoint Mawenzi Peak on our left, and Kili Kibo Crater (the summit) on our right. 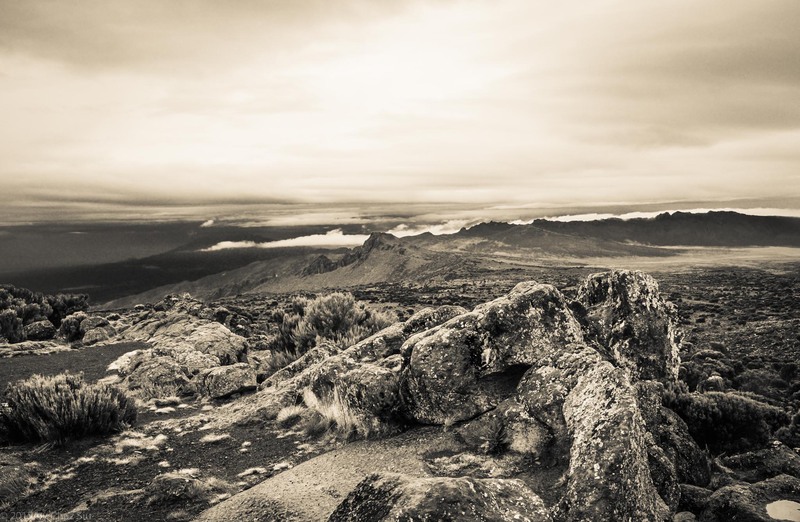 The land quickly transitioned into the surface of the moon, strewn with rocks and virtually no flora to be seen. After about 1200 feet ascent, we were a little shocked to see the remains of a cape buffalo, eyes wide open staring at the sky. 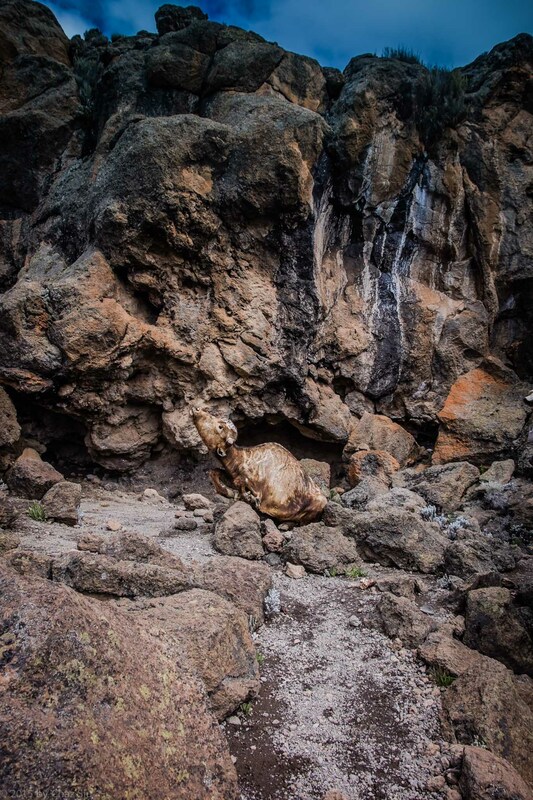 JT explained that around 2012, the buffalo had come up to the high elevation (around 14,200 feet) to lick the sodium ash and gotten its horns stuck in the crag; the folks at nearby Kibo Hut had heard it, but there were no attempts to free it, as the cape buffalo is universally noted as one of the meanest animals in Africa, not afraid to charge vehicles, toss big cats…and people around with its horns. It died after a few days…the corpse had no horns and had obviously been pulled out of where it had died and propped up on the rock. Kinda surreal. At some point, we crossed 14,500 feet, higher than Mt Whitney, the highest point on the continental US, and officially marking the highest any of us had ever climbed. Everyone was doing great, including Caryl, now fully recovered from her headaches, albeit still fighting her sinuses. We were now climbing loose scree, a sign of what we’d be climbing on our ascent. 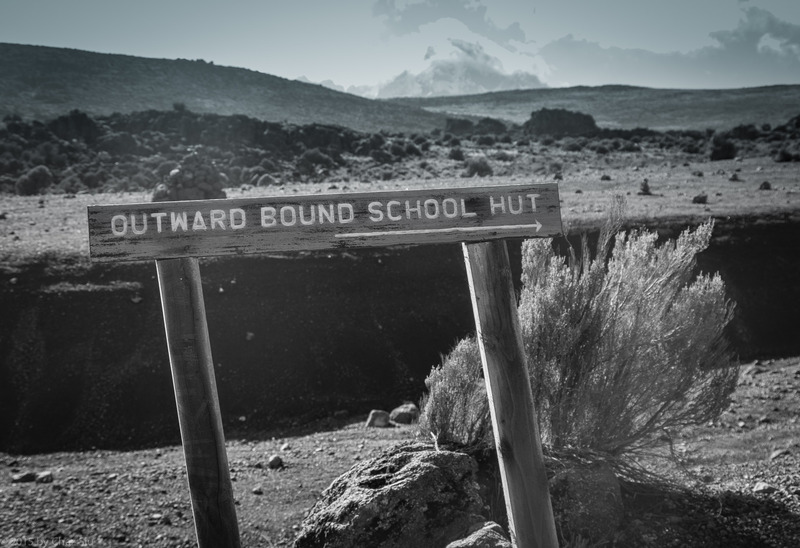 Again, pole pole pace to the rescue prevented the steps from sapping our energy the way loose gravel can, and at length we spotted School Hut camp above, nestled in the rocks…our base camp for the summit attempt. We came into camp around 11:30am, signed in, had lunch and listened to JT’s briefing. 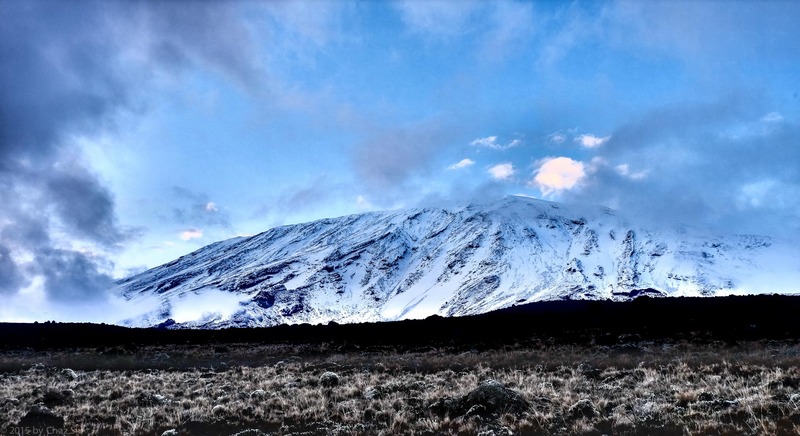 “Get your naps in between lunch and dinner, and after dinner – we’ll be starting the summit climb at 11pm” Though it alternated between sun superheating our tents and drifting snow and mist, we hit the hay and did our best. All the days on the mountain were finally coming to fruition! School Hut Above Us at 15,500 feet. It’s Like Moon Up Here!. Socks Dry Out At School Hut (15,500 feet). It’s Almost Summit Time! 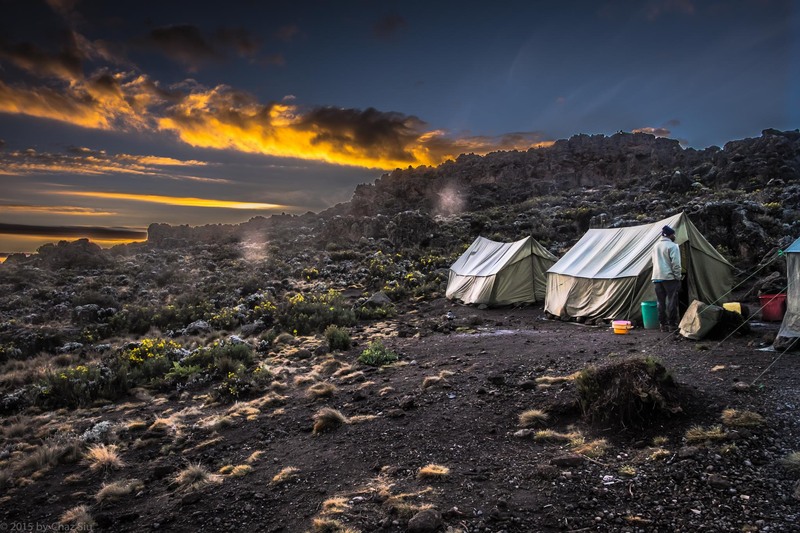 Buffalo Camp, situated above the Kenyan Plains, made for the best morning on Kilimanjaro so far, with unobstructed views of Kilimanjaro swathed in snow above us, orange African sunrise to the West, and grand views of the Kenyan landscape below, rolling hills dotted with trees. I spent two hours before everyone was up snapping the changing views as the sun rose. 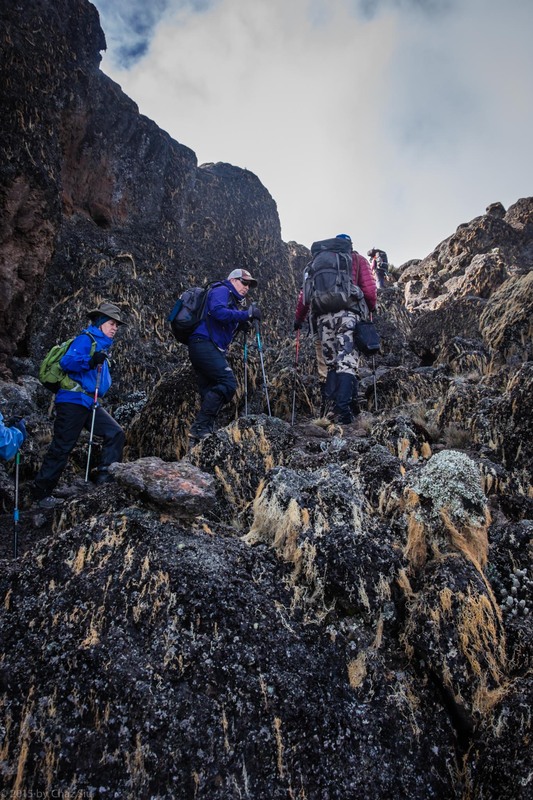 We set out into–what else–a misty undulating traverse to Third Cave Camp at 13,000 feet. 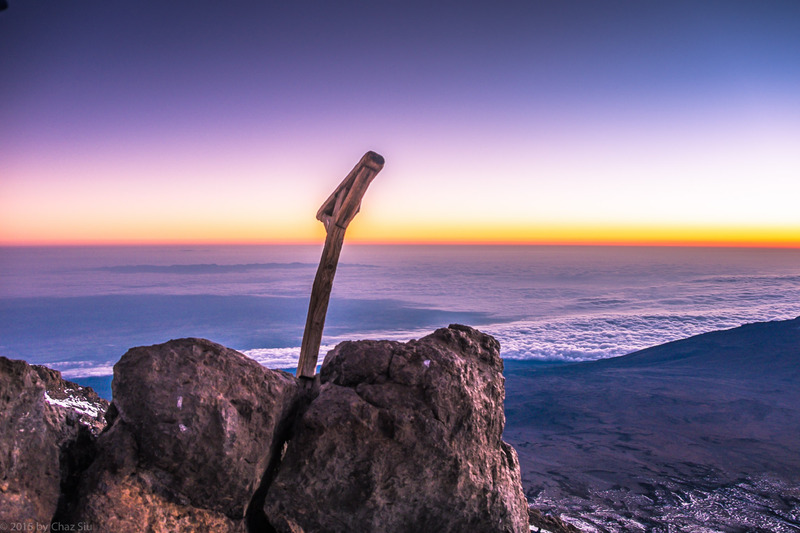 However, unlike our other hikes of recent days, the mist cleared out, and we were left with spectacular views above the clouds the whole way – the views hike we’d imagined when we all signed up. Caryl was on day 3 of splitting headache, and at the end of the day, she recalled very little of our best hike segment so far. 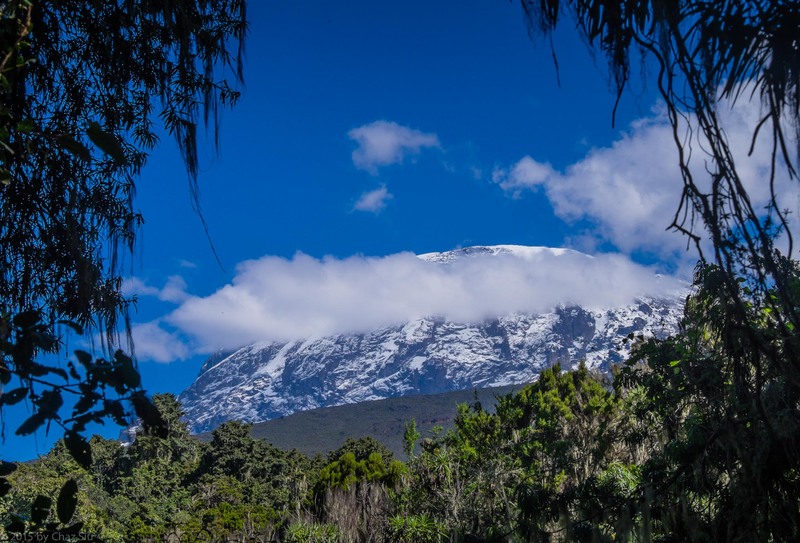 At some point, we came over a ridge and got our first glimps of Mawenzi, the second of three volcanic cones that make up Kilimanjaro. 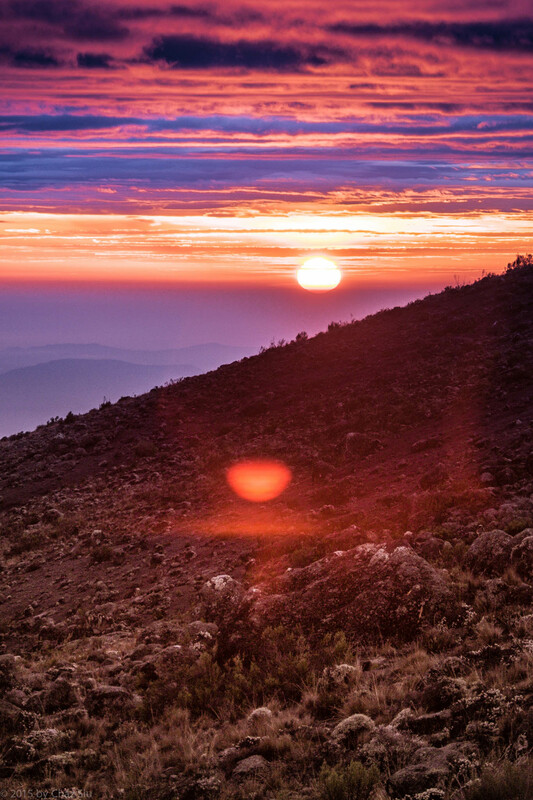 The first, you may recall from earlier posts, was Shira, of which the Shira Plateau represents the collapsed caldera. Mawenzi, like Shira, is also extinct. 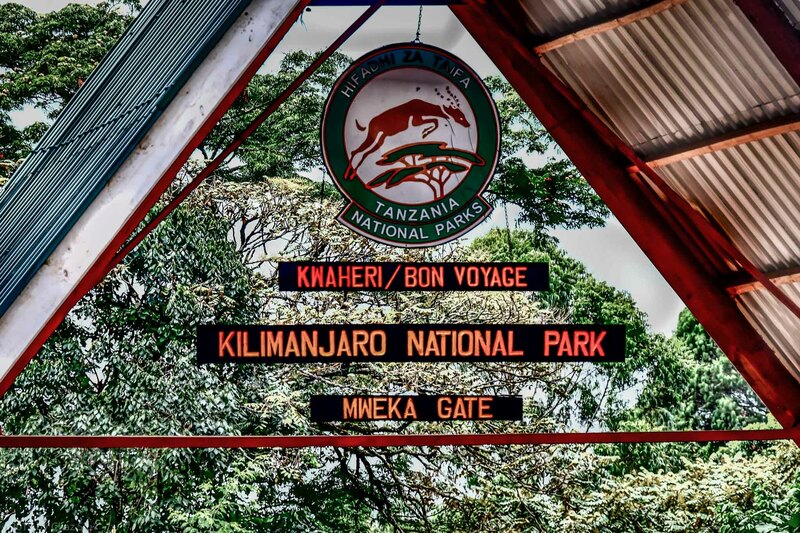 It is only climbable via technical gear, but JT indicated that after a fatal attempt in 1989, the Tanzanian park service cut it off from any climbing. 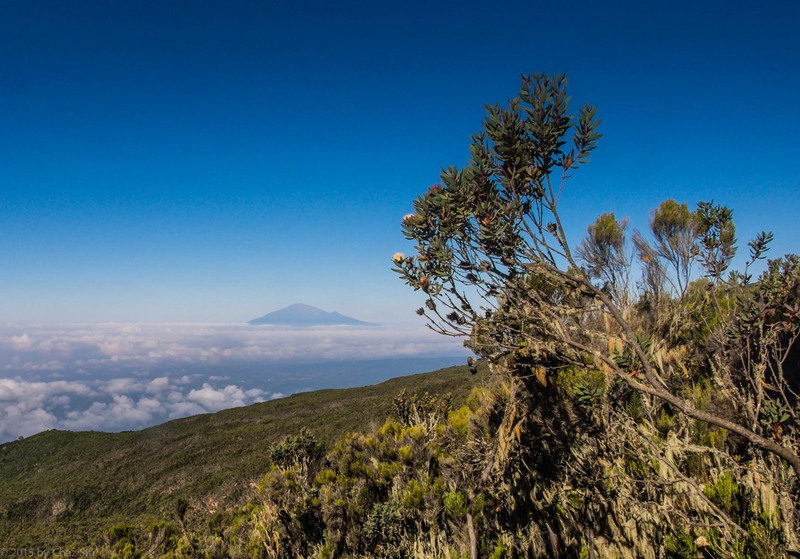 Kibo is still active, with gas still emitting from its crater and represent the highest of the volcanic cones. 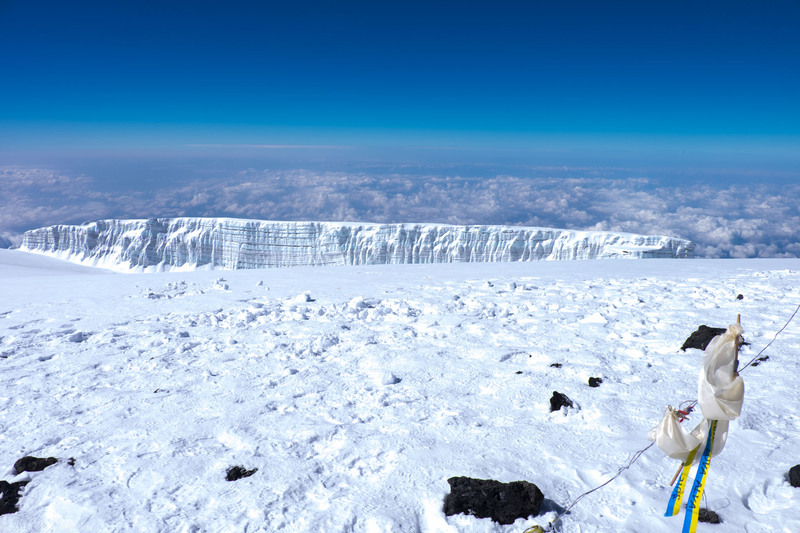 At any rate, the sight of Mawenzi was pretty awe inspiring the way it sat across the mountain from us. Eventually, we came to gash in the side of the hill that was First Cave. We made our snack/lunch break there. The cloud formations below were pretty amazing, including a big nuclear bomb shaped cloud rising above the rest. At last, across a wide ravine, we saw Third Cave. 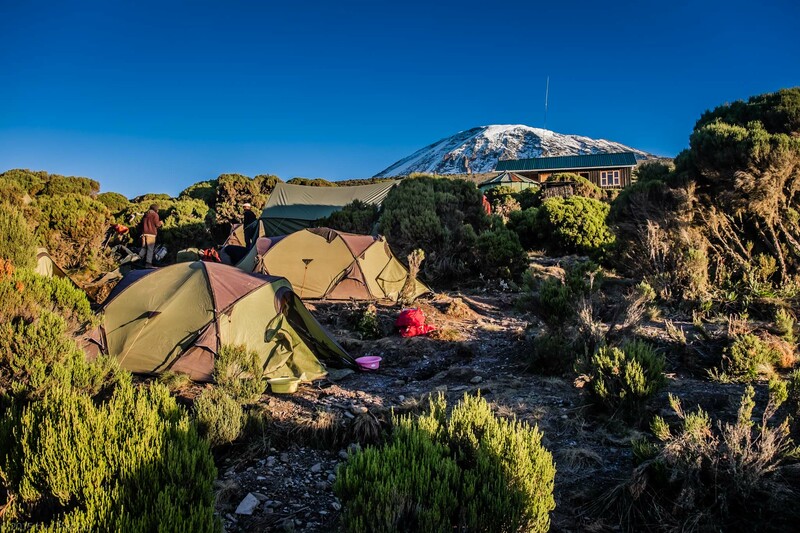 The camp was situated at such a steep mountain angle, the whole thing looked a little sideways, but it was sunny, and we relished a relaxing afternoon and evening. 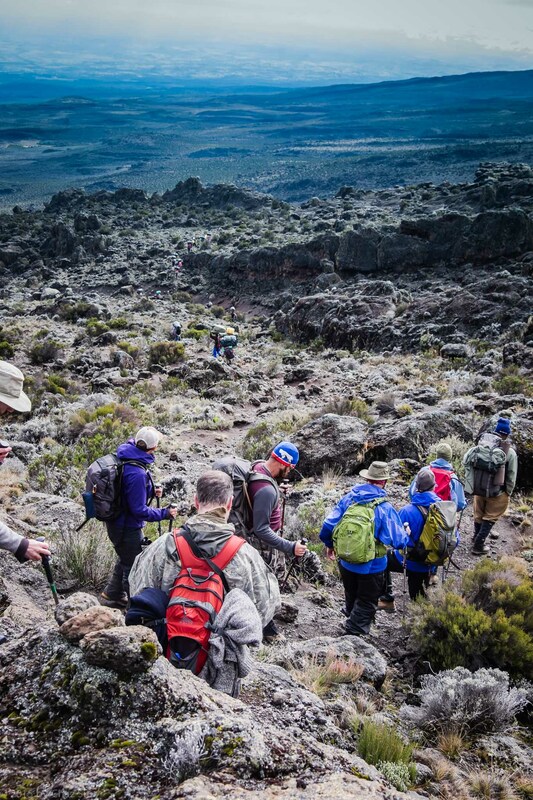 The real ascent up Kilimanjaro would begin tomorrow. In the meantime, Caryl and JT chatted, and Caryl became team member #4 on Diamox to ease her headaches. We would see the next day. I woke up at 0-dark-thirty as usual and waited out the sunrise. 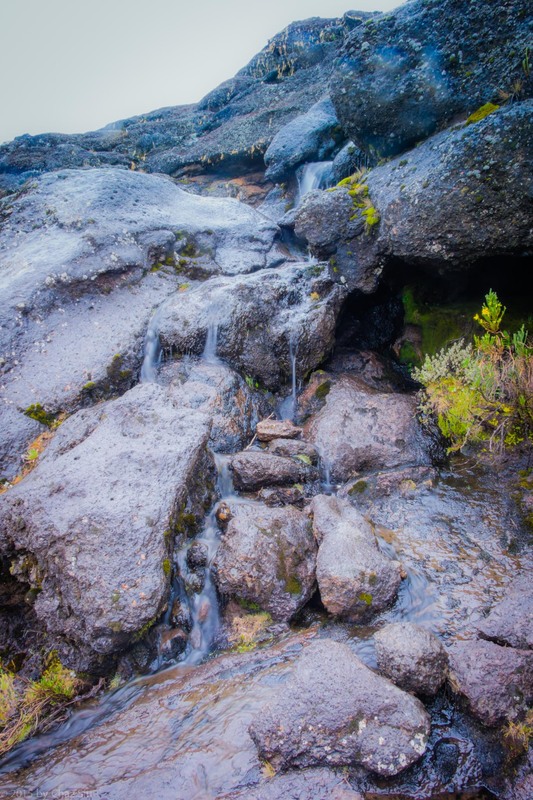 The waterfalls cascading down the rocks were the first we’d seen since the Day 1 walks through the rainforest. 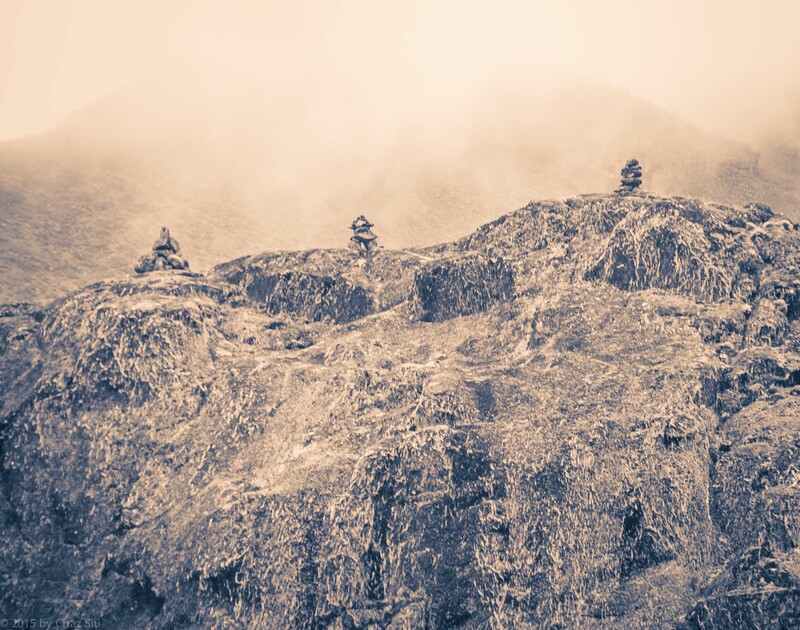 To my left, there were three cairns perched precariously on a high cliff above the camp, the route we’d be taking out of Moir Hut later that morning. With Moir Hut at 13,632 feet and our target destination Buffalo Camp at 13,600 feet, we assumed we’d be doing a fairly flat traverse around the northern side of the mountain, but the way out of Moir Hut was a super steep switchback with 500 feet of straight elevation gain.Pole Pole pace makes these kinds of ascents not only possible, but fairly straightforward, as long as you’re not suffering any altitude effects. Caryl was in her 2nd day of on again, off again brutal headaches and combating sinuses as well, staving off Diamox for the moment, while the three members of the team on Diamox were back to normal and doing great. The rest of us marched onward to little effect, though I think Irina had mentioned a headache here and there. 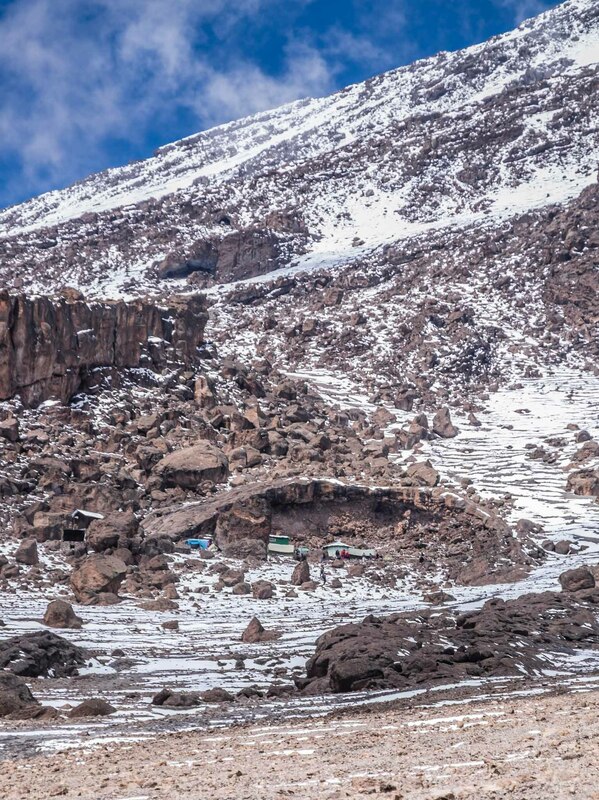 As we were headed out of Moir, we could also see the porters for the camps taking the Lava Tower route (the same we had done for acclimatization the day before) across the way. 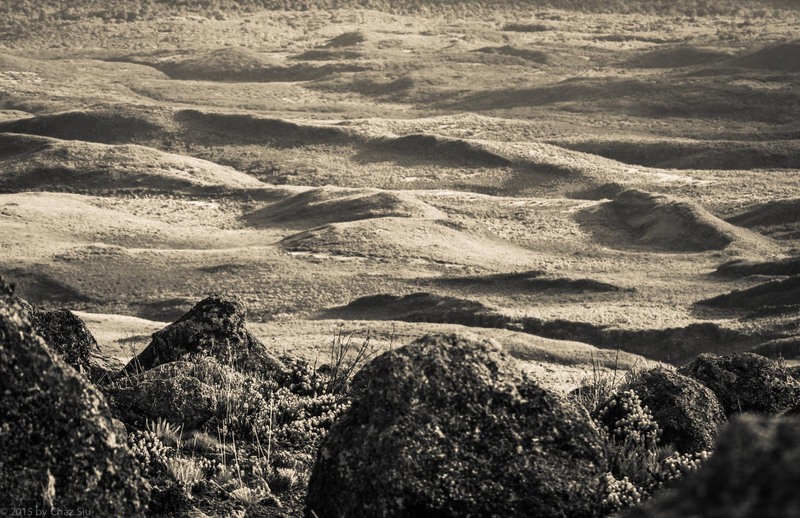 Tiny people, a vast and rock strewn landscape. No surprise, we were once again shrouded in mist, with limited views below. 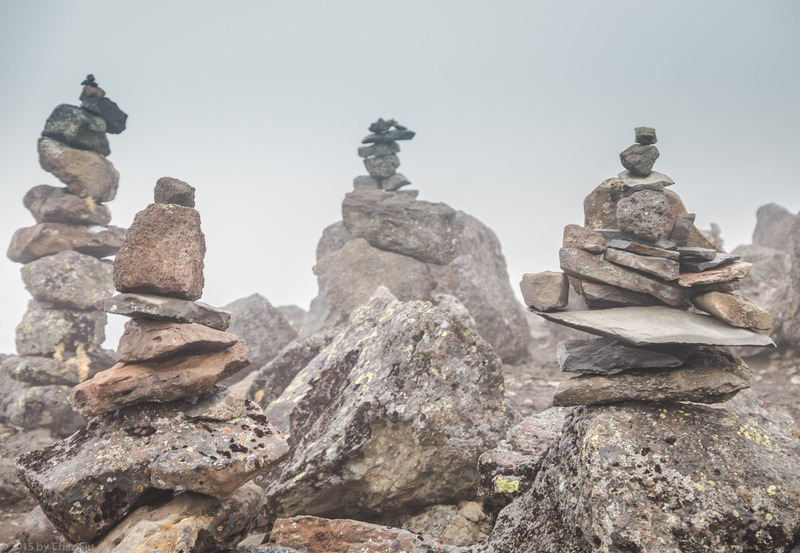 About 45 minutes out of camp, we took a 100 foot boulder scrambling detour up the lowest of three Lent Hills [13,728 feet], where the biggest cairn forest we’d yet seen awaited us. We relaxed in the mist up there, unable to see much.. “How far is it down there?” we asked Said, pointing down off the cliff into the white mist. “You should move away from that cliff edge and be careful,” he replied. Well, that’s as good an answer as any. We took our requisite team photo, scrambled back down and headed for Buffalo Camp. 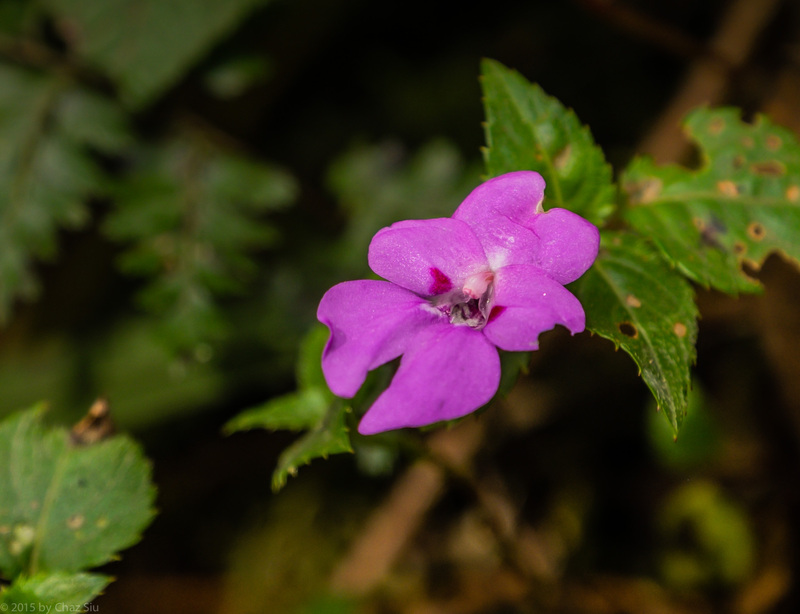 Buffalo Camp was different – it was on a fairly stiff decline on the mountain, and we first saw it across a giant ravine, along with our beloved cafe. 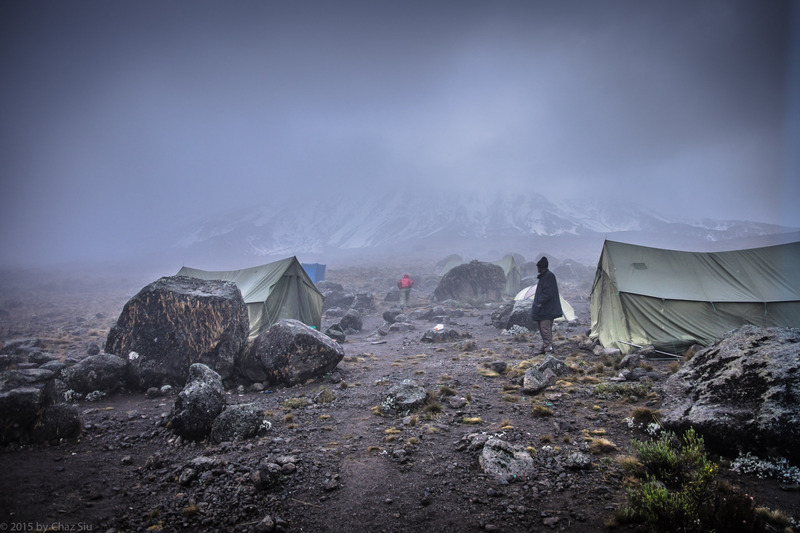 I took a picture looking up at still snowbound Kilimanjaro from the camp, shrouded in mist. I should note that we’d gotten used to the mess tent being canted so steeply that those of who sat on the lower side always felt a tip away from rolling backwards and bringing down the tent.But hey, they brought us warm food for our bellies, so we made it work with just the occasional wry comment or two. I felt a little queasy at lunch, ran outside and hurled behind a boulder, slept for a half hour, then all was right with the world. I think it was something I ate, rather than altitude, since it came out of nowhere, and never happened again. 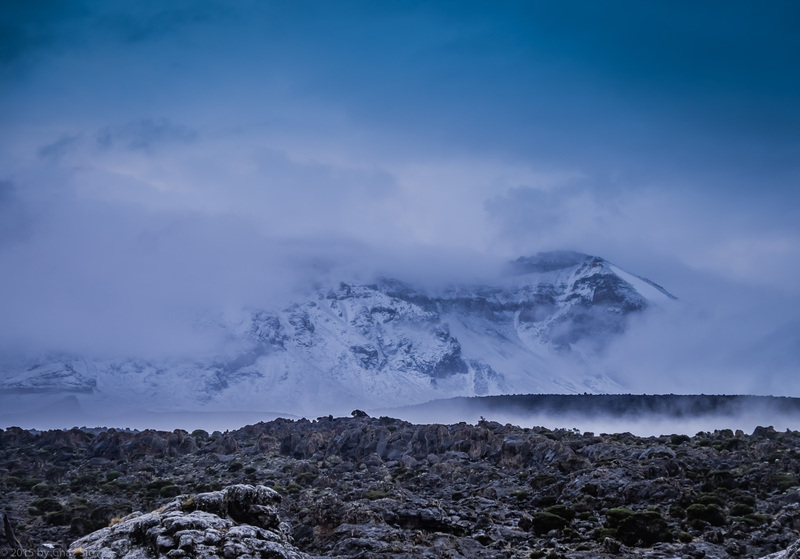 Pea Soup Mist At Buffalo Camp With Snow Covered Kili In The Background. Note the angle of the ground the mess tent (right) is on. 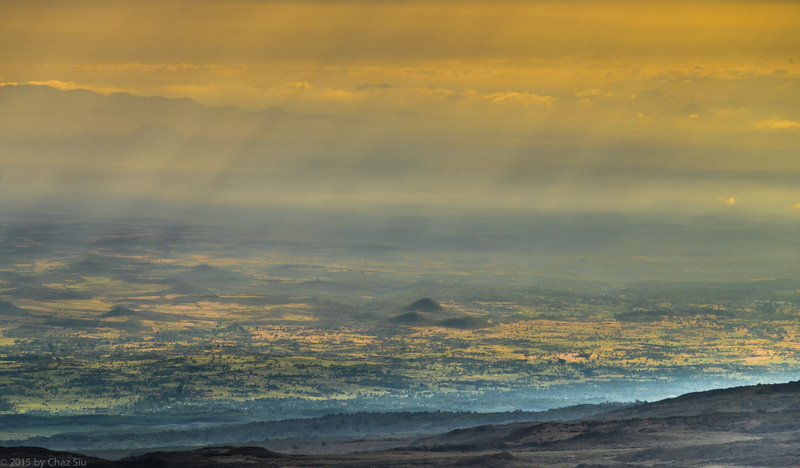 The weather never quite cleared up that night, but we had spectacular views of cloud tops, with the plains of Kenya and Tanzania hidden below. We slept like big baby rhinos and although JT had warned of winds and rain, we had a brief patter and then nothing but the asychronous cadence of snores across the campground. Remember that red mountain with the snow crown last night (yesterday’s post)? 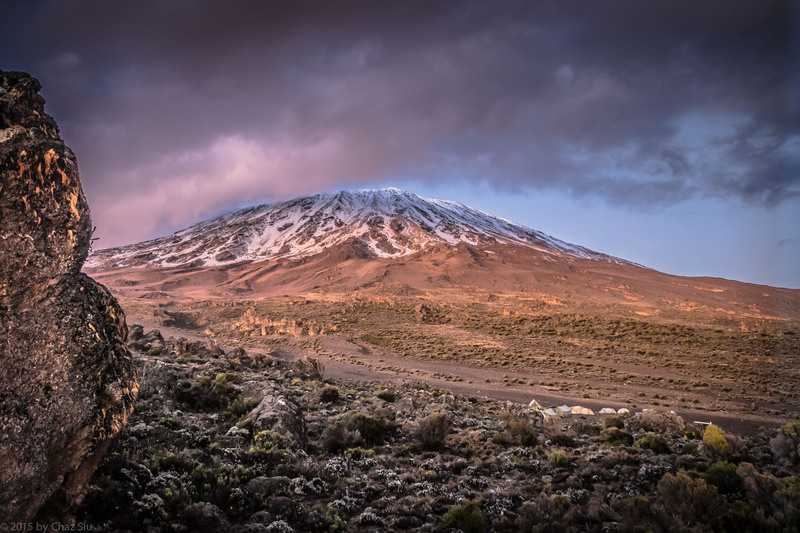 I come out of the tent at 5:30am and as the light in the sky brightens, my mouth drops open at the sight of a Kilimanjaro, completely blanketed in snow and more cloud plumes flowing off of it. 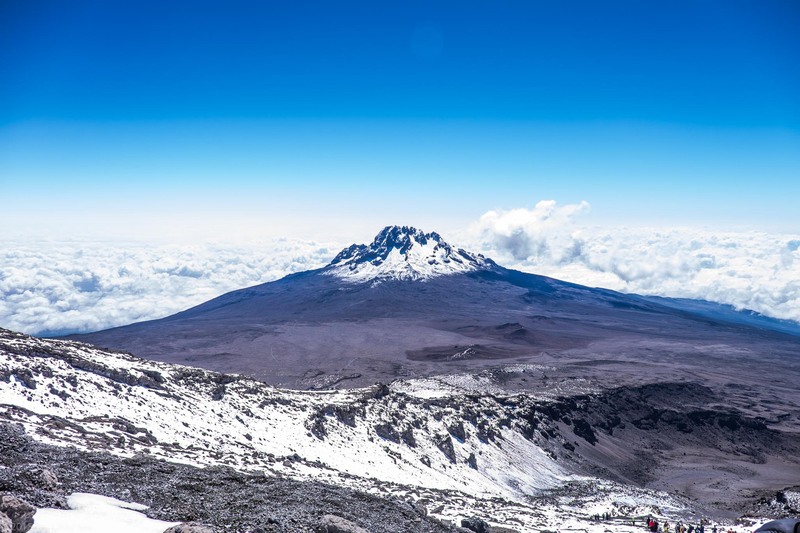 “Damn,” I yell to our team, still asleep in their tents, “Looks like we’re gonna be making an Everest attempt, not a nice hike up to Kili.” A few of them crawl out and look at the snowed in beast of a mountain before clouds consume it. Forgot to mention, late in the evening, a porter walked into camp with my missing bag on his head, having walked 20km and ascended to 13,000 feet in one day to get my gear to me. Hallelujah! My poles, my rain gear…it’s all there. I sleep well, despite pounding rain. 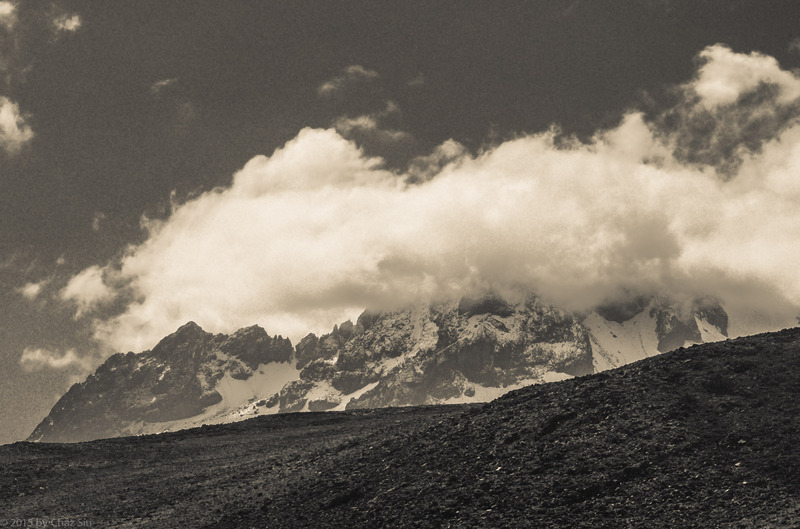 Destination today is Moir Hut, which is an eastern traversal and ascent to 13,750 feet, higher than most all of the mountains we’ve climbed in California except Mt Whitney. The mist and clouds are clinging to the cliffs above us, and the views down to the Shira Plateau and Shira Cathedral are spectacular. 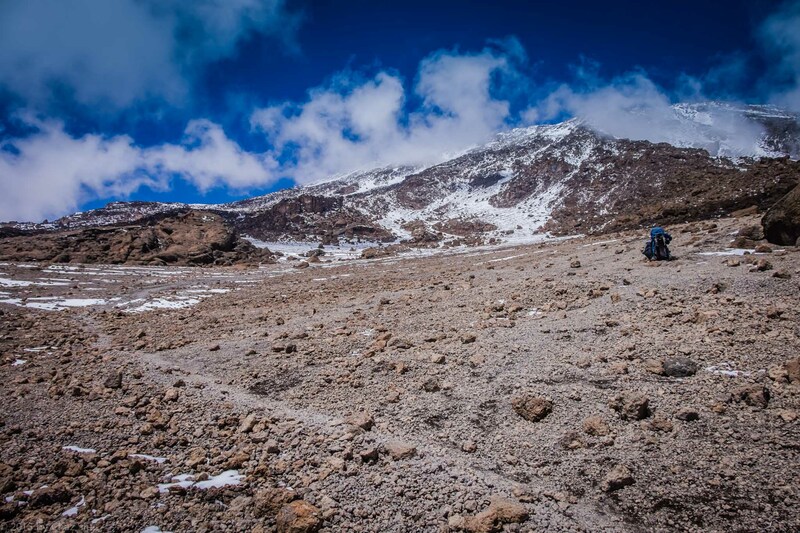 The ascent out of Shira Hut starts on the same fairly steep, meandering route through volcanic stone we used for yesterday’s quick acclimatization hike. It’s about 4 hrs or so, 5 miles, and constantly shrouded in mist. At length, we arrive at camp, and it’s pea soup – we can’t even see our camp until we stumble past the bright blue Internet Cafe. Just like clockwork, as soon as we get the gear off and into the mess tent, the rain starts and hammers away while we eat lunch. 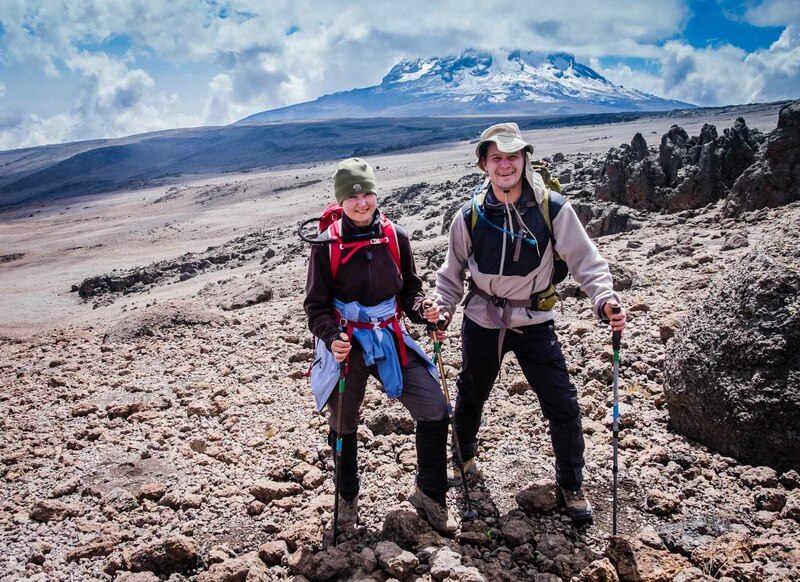 We groan when JT comes in and says we’re doing an acclimatization hike at 3pm. 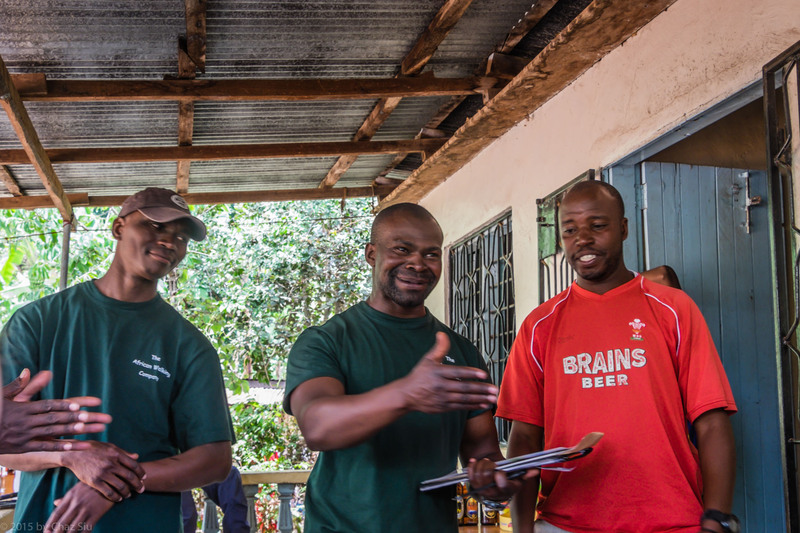 When we ask him about the rain…he says rain or shine, we go. Just like magic, right at 2:55, the rain stops. 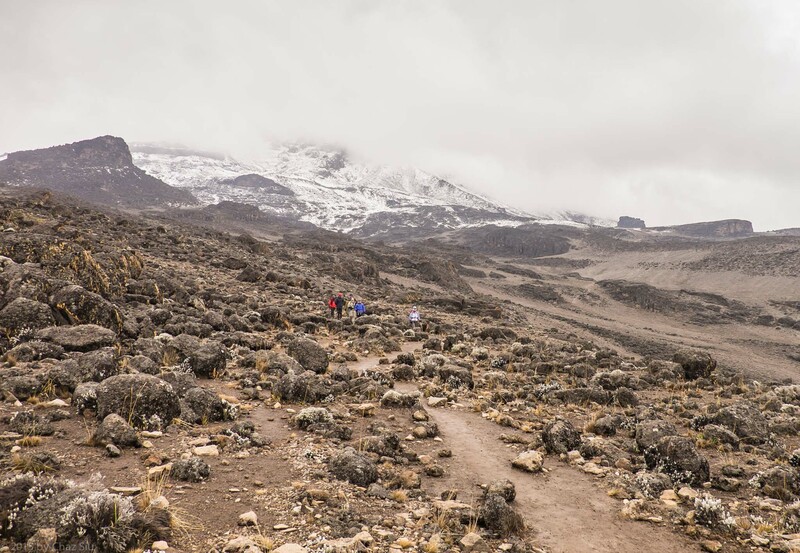 Rhys stays down again, choosing to stay warm and confident his acclimatization is going well, but the rest of us gear up, JT leads out this time, marching up the steep switchbacks below the overcast skies. The geology up here is craggy and spectacular, with layers and fault lines clearly visible. CLICK TO EXPAND: Geologic History In the Rocks Above Moir Hut. Camp is the tiny cluster of tents to the far left of the picture, 300 feet below. 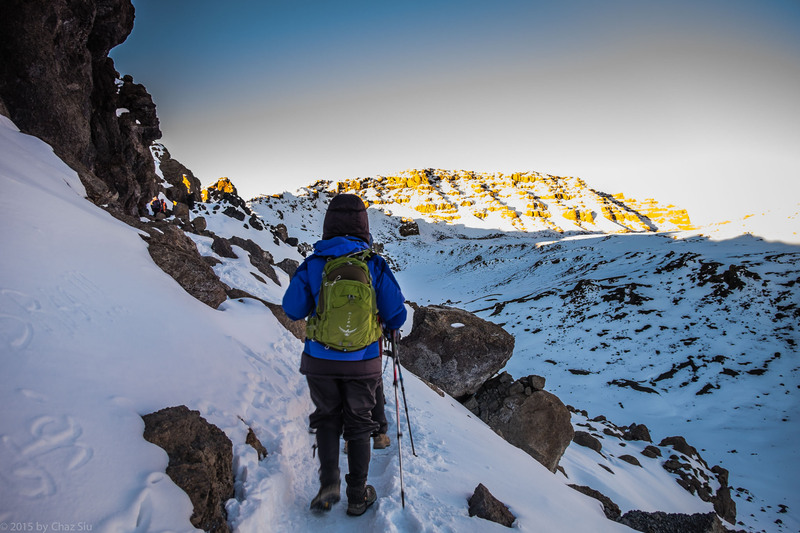 This time we climb to around 14,200 feet to a junction below Lava Tower, only a couple hundred feet lower than the highest mountains any of us have climbed. The air is incredibly crisp, clean, and cool up here, and the winds blow hard. It’s a very stark looking landscape up here, not quite lunar, but boulders strewn carelessly all over by some giant hand. There’s also a little sparrowlike bird called the alpine chat bouncing all over the place, trying to munch our snacks. Couldn’t really nail them down for a pic, fast little buggers. 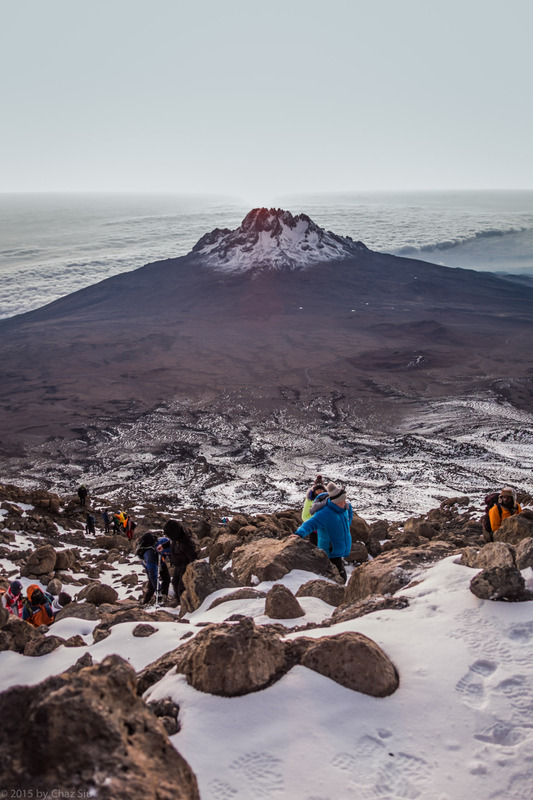 The idea behind acclimatization is to reach the altitude, stay there for 15-30 minutes, then head back down, which after munching our chocolate bars, we do. 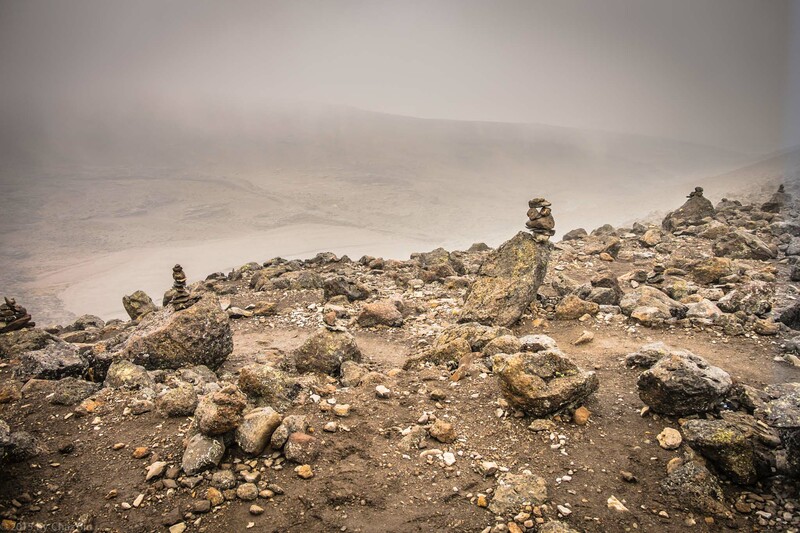 The second hike of the day took us 3 hrs; we return to Moir Hut in the mist and settle in for the long night; after dinner and into our tents, rain and sleet start up again, but by this time, we’re so used to it, everyone crashes hard. Cort is now our 3rd party member on Diamox, while Alex and Paul have recovered and are going strong as ever. Caryl is dealing with sinus issues and and a headache that seems pressure related, depending on when she is standing, hiking, or sitting, but she’s going to gut it out for now.